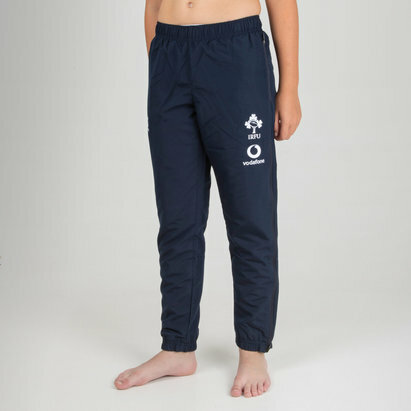 Whether it's out and about, in training or at the Aviva Stadium, make sure you look your best in these Ireland 18/19 Tapered Hybrid Rugby Pants from Canterbury. These pants come with VapoDri technology to keep you cooler and drier, and have stretch woven fabric inserts to the lower leg for optimum freedom of movement. The pant features pockets to the side seam and a zipped rear pocket for additional security. Ankle zips ensure easy adding and removal, while the adjustable waist with internal drawcord ensures a secure and comfortable fit. These pants are navy. The Ireland Shamrock and CCC logo are embroidered onto the left and right, respectively. The team's partner, Vodafone - a collaboration since 2016, is embroidered underneath the shamrock. Keep it fresh in these Ireland Tapered Hybrid Rugby Pants.